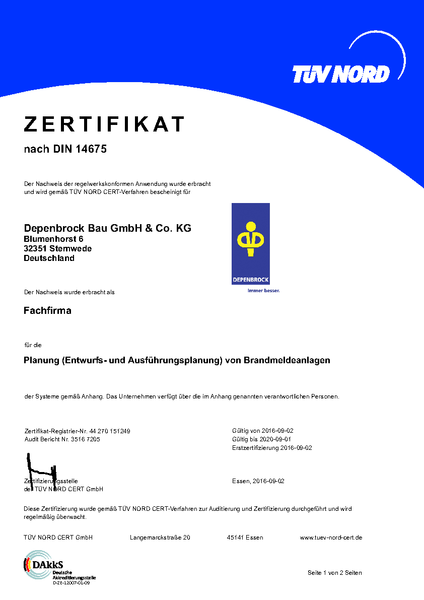 The Quality Association for Underground Cable and Pipe Construction (Gütegemeinschaft Leitungstiefbau) is a nationwide group of companies specialized in underground cable and pipe construction, primarily active in the underground cable construction und highly committed to quality. The Quality Seal Channel Construction applies to the production and maintenance of public and private sewage water pipes and channels and the related buildings as defined in DIN resp. DIN EN standards and the applicable rules and the registered German Association of Water Management, Sewage and Water. We have gained the Certificate AK1. We entered into a supervision contract with the TÜV for operations according the Water Management Act. A certified company has the special equipment und qualified employees in order to secure the compliance with the standards according to § 62, section 2 of the Water Management Act. Prequalification is a prior and general examination of the documents of qualifications according to the requirements defined by § 6 of the German Construction Contract Procedures (VOB/A). Thus construction companies interested in public tenders can prove their suitability to public clients at reduced costs in the future.